See also: MerleFest; Old-Time String Band Music. Whether lightning-paced and exuberant or slow and mournful, the songs of bluegrass music are immediately recognizable by their tight vocal harmonies; precisely arranged string band instrumentation featuring banjo, fiddle, mandolin, and guitar; and legendary "high lonesome sound." An essential differentiation between bluegrass and the "old-time" country music that preceded it is that of the banjo-playing styles in the two genres. In old-time music, the banjo player employs the "clawhammer" style, also known as "frailing" or "drop-thumb," while bluegrass utilizes the three-finger roll or crawl style developed by Earl Scruggs of North Carolina's Cleveland County. This style of American folk music takes its name from its most famous early practitioners, Bill Monroe and the Blue Grass Boys, with Kentuckian Monroe long known as the "Father of Bluegrass Music." After 1945 the bluegrass sound exemplified by Monroe and the Blue Grass Boys, with the revolutionary banjo playing of Scruggs, swept North Carolina with its exciting new music displaying strong roots in the brother duet and string band styles. Scruggs, who received a North Carolina Folk Heritage Award in 1996, helped make bluegrass internationally popular through his work as a member of Monroe's band and subsequently in his own duo with Lester Flatt (Flatt and Scruggs), an act that called Raleigh home for a time after World War II. Although virtually every important band from the early days of bluegrass music featured North Carolinians or performed on radio stations in the state, few North Carolina-based bands achieved fame at the time. Among the best known were Hack Johnson and His Tennesseans, the Church Brothers, and the Murphy Brothers. At the end of the 1960s, Raleigh's ephemeral New Deal String Band became the first progressive, "hippie" bluegrass ensemble to achieve widespread notoriety. 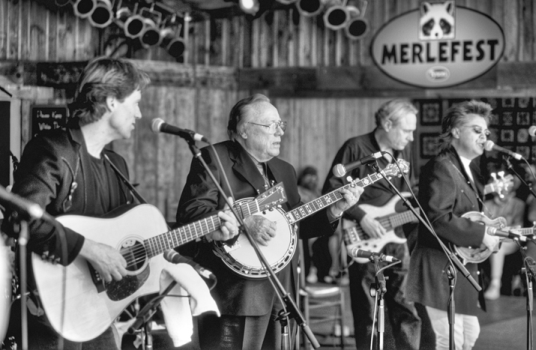 Burlington's Bass Mountain Boys stood among the most popular nationally touring acts in bluegrass from the late 1980s until their 1996 breakup. New Vintage from Raleigh also earned extensive national airplay. Another North Carolinian considered an American bluegrass ambassador to the world is Arthel "Doc" Watson, the great banjo player and flat-picking guitarist from Deep Gap, to whom the University of North Carolina at Chapel Hill awarded an Honorary Doctor of Letters degree in 1997. Other North Carolinians well known in the world of folk and acoustic music include Charlotte's Arthur C. Smith and such ensembles as the Bluegrass Experience, the Sons of Ralph (Lewis) Featuring Ralph, and the Shady Grove Band. Other important twentieth-century North Carolina banjo players performing in bluegrass and related genres include Charlie Poole, Tommy Jarrell (a National Folk Heritage Award winner), Fred Cockerham, Bascom Lamar Lunsford, George Pegram, Kyle Creed, Clarence Tom Ashley, Dink Roberts, John Snipes, Odell Thompson, Jan Davidson, Don Lewis, Lynn Smathers, Nancy Sluys, and Union Grove old-time banjo champion, Hollow Rock String Band member, and Red Clay Ramblers founder Tommy Thompson. Bluegrass festivals large and small occur all over North Carolina and the South from early spring until late fall. One of the leading events is late April's Merle Watson Festival, popularly called MerleFest, in Wilkesboro, named and held in memory of Doc Watson's late son. Thank you for visiting NCpedia -- and for letting us know! We're glad you found helpful information!